Local residents and volunteer conservationists have this morning stopped logging operations in a stand of rain-forest that should be protected from logging. In August government logging agency VicForests was taken to court for logging rain-forest. One of the conditions of the out-of-court settlement was that they train officers to properly identify rain-forest, and not log any more rain-forest. Yet rain-forest logging has been discovered on Yellowdindi Road, near Toolangi. “A new scientific survey, mapping the logged rain-forest in this location, has been submitted to the Department of Sustainability and Environment. So far, they have failed to step in and stop the logging,” says local Toolangi resident, Kerryn Blackshaw. Residents have made repeated requests for the logging to stop immediately. “You can see how close the bushfires came, and to think there’s a refuge, a rain-forest place, that they’re now logging, it’s just devastating,” says Ms Blackshaw. 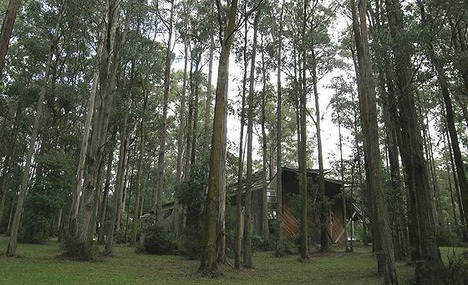 “It is appalling that the Baillieu government is allowing rain-forests that escaped the 2009 fires to be logged for wood-chips”, concludes Ms Blackshaw. Here are some links re Leadbeater's Possums.